If you are a small business owner, you likely don’t have a lot of free time. Yet at the same time, you want to be on top of your game in terms of your professional and personal lives. Reading books — especially ones with tips on how to better yourself — can be one way to keep your mind sharp and keep you focused on your goals. But as with anything else, there are thousands of books out there that all profess to be the “best” when it comes to helping you be a better business owner or a more successful person. So how do you know what you should be reading in your limited free time? 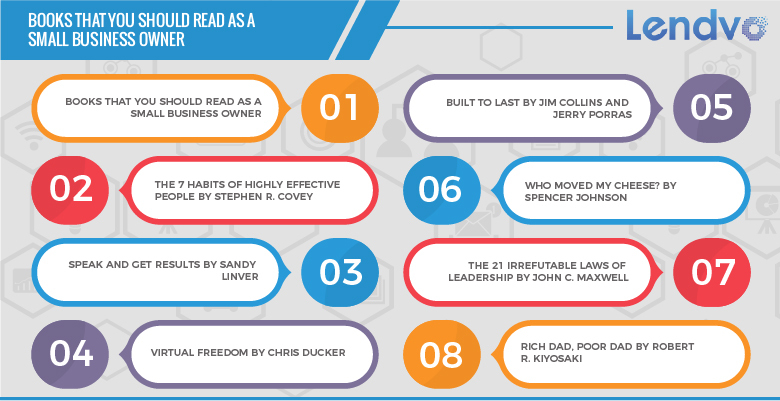 We’ve come up with a list of some of the best books that small business owners can read. While this list is by no means comprehensive, it represents some of the better reads for anyone seeking to move ahead in their career, including expanding and developing their enterprise. Check out our list before your next trip to the bookstore so you can get ahead of the curve when it comes to essential reading. This book is a classic for a reason: it is a fantastic guide for achieving both personal and professional success. Author Stephen Covey understands that true success doesn’t come solely from achieving in the business or professional world, but from balancing your personal and professional life. With that in mind, Covey’s advice draws on ways that you can be more effective in both arenas — giving you a method of achieving greater things. One of the best lessons to be learned from this book is how you should start a project — such as an expansion of a current business operation — with an end goal in mind. Doing this will help you be more effective in structuring your project, and be more efficient in achieving your goal. When you can visualize what the end of your project will be, it becomes that much easier to accomplish bigger and better things as a small business owner. It’s a simple fact of life: not everyone is a natural when it comes to speaking and communicating. Whether it’s public speaking, sales or one-on-one talks, speaking can be challenging for many individuals. But when you are a small business owner, having trouble with speaking in any of these situations can hold you back from growing your business. That is why Speak and Get Results is such a fantastic read. It can help people who struggle with speaking to learn to do so more naturally. Author Sandy Linver uses formulas to help readers design templates based on specific situations, such as sales meetings, client proposals or staff meetings. Using these templates, you can put together a speech or presentation that is designed to get the results that you want. This book is one of the best reads on business speaking out there — and can help you take your business to the next level if you find speaking to groups or individuals to be challenging, or if you simply want to polish your business speaking. As a small business owner, it can be hard to let go of control of the day-to-day operations of your company — even when doing so would actually benefit your business. Entrepreneurs often believe that they are superheroes who can handle everything by themselves, and who maintain tight control over every aspect of their business. This can often lead to burnout or just plain inefficiency, as a business owner’s valuable time is spent doing administrative tasks instead of more valuable strategic planning. Author Chris Ducker understands how easy it is for entrepreneurs to suffer from “superhero syndrome” — and how they can escape from it through outsourcing some of their tasks to virtual employees. Ducker points out that in the modern era, small business owners have the option of building a virtual team of employees to help run their business, freeing them up to grow and expand their company — or to simply live and enjoy their lives more. He offers a three-step exercise to determine what tasks should be outsourced, having business owners ask themselves (1) which things they really don’t like doing; (2) which things they shouldn’t be doing; and (3) which things they aren’t good at anyway. Based on the answers to these questions, virtual employees can be hired to free up valuable time. For any small business owner who struggles with time management and delegating tasks, Virtual Freedom is a fantastic read. Stress over the future is a fairly natural state of being for many small business owners. Will your company stand the test of time? In Built to Last, authors Jim Collins and Jerry Porras look at eighteen companies who have stood the test of time to find the characteristics that contribute to longevity. Their insights can help small business owners as they build their own companies. By identifying common practices among this range of companies, Collins and Porras provide a framework for any business seeking to establish a lasting presence in the marketplace. Reading this book gives small business owners a framework for success. It can help you avoid some of the pitfalls of less successful companies, while taking advantage of the lessons learned by the more successful companies in the United States. This book has enjoyed popularity and a presence on the bestseller list for years — and for good reason. In Who Moved My Cheese?, Author Spencer Johnson explores a topic that is a fundamental part of life for everyone (including small business owners): change. While change is something that we all must deal with, it is something that makes us all uncomfortable. Learning to embrace change, especially as business owners, can help to make us more successful. This book teaches you that change will occur, and it’s the attitude that you have towards change that matters. In the business world, maintaining flexibility towards changing market conditions can be a tremendous asset, allowing you to adapt and recover as necessary. Whether the change in your business involves a new government regulation, a long time employee retiring or a new technology emerging, the ability to handle the change is crucial to your ability to survive. This book is a must-read for anyone who owns their own business. If you own a small business, you are a leader — like it or not. You lead your employees, you are likely a leader in your community, and you may even be a leader in your industry. Learn how to lead effectively and skillfully from author John C. Maxwell, an expert with more than thirty years of leadership experience. His insights will help you develop and hone your ability to lead your business. The format of the book can serve as a checklist for you as you work on each of the specific skills presented in the book. When it comes to financial advice books, this tome by author Robert Kiyosaki has stood the test of time. It delves into the concept of making your money work for you instead of you working for money by investing wisely. The concepts presented in this book can be incredibly useful for small business owners as they invest their profits and decide how to grow their business. In particular, the idea of “three piggybanks” for children — one for saving, one for investing and one for giving — can be translated to your goals as a business owner. Setting aside funds for saving for big ticket items, such as an expansion, and investing funds towards future growth, can help you work smarter, not harder. This book may not be marketed as a book for small business owners, but the advice presented is incredibly valuable for anyone looking to improve their financial standing. When your time is limited, knowing what to read to better yourself is critical. These books each have a proven track record of success in helping small business owners. Picking them up and absorbing their lessons can help you as you journey towards your ultimate goals of growing your small business.